This module applies concepts covered in the module, Fog: Its Processes and Impacts to Aviation. It examines the fog processes at a tropical location: Guyana. A basic overview of the main fog types is provided, and then a detailed analysis is done for a representative fog event at the Cheddi Jagan International Airport in Guyana. 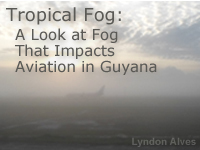 Conclusions are made about fog processes in Guyana which can then be applied to forecasting for aviation impacts. Good overview of fog at the airport in Guyana. this hits it on the nail so far for fog in Guyana because i am from Guyana and i could tell is is what happens in terms of the fog type Ie radiation fog. Un caso muy interesante bien explicado apto para cualquier nivel de conocimiento. This is a very nice case study of fog development, with clear explanations of the various types of fog, and analysis at a particular location. The process-of-elimination discussion of fog types makes this module of general interest beyond just tropical or aviation audiences. List the main fog types and explain the processes that lead to the formation of fog for each type. Suggest which fog types are possible in Guyana’s Cheddi Jagan International Airport. Analyze a representative fog event for the area around the Cheddi Jagan International Airport in Guyana and explain the dominant processes. Identify trends and features associated with fog evolution in observed data such as weather observations, river temperatures, and satellite products. Use the local data to analyze and predict local fog evolution. Suggest atmospheric variables to monitor when forecasting aviation impacts from fog. fog, tropical fog, radiation fog, advection fog, precipitation fog, valley fog, upslope fog, steam fog, evaporation fog, sea fog, sea breeze, sea breeze fog, aviation, airport operations, Cheddi Jagan International Airport, Guyana, Caribbean, Demerara River, aviation forecasting, nocturnal fog, radiational cooling, radiative cooling, diurnal cycle, dew point depression, visible satellite image, infrared satellite image, satellite IR difference field, GOES-13, GOES-13 fog/water cloud product.